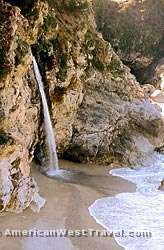 Roughly fifteen miles south of the town of Big Sur, Julia Pfeiffer Burns State Park preserves another spectacular section of coastline. 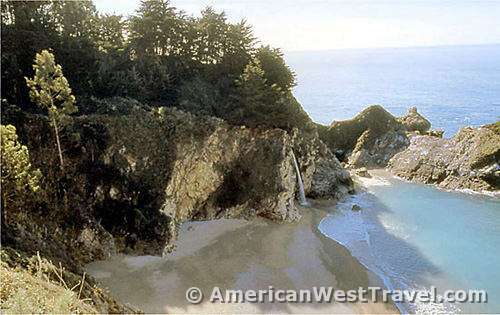 It features beautiful McWay Falls, an eighty foot waterfall which empties directly into the ocean. 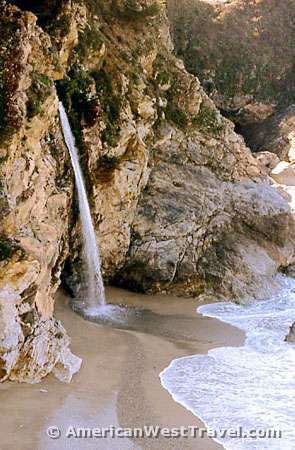 The falls and the beach are not accessible, but you may view and photograph the above vista from the Overlook Trail. 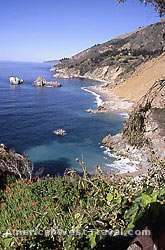 The Overlook Trail curls around the cove to both headlands and offers exciting coastal views of cliffs and ocean to the north and the south. Photo, near right, looks towards the north. 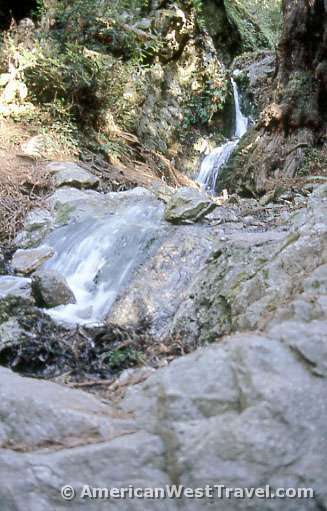 At far right, a closeup of the falls. 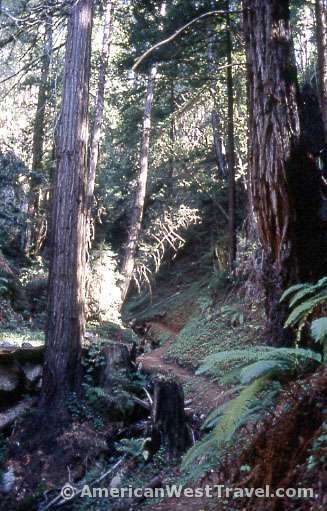 The trail along McWay Creek is lush with vegetation. Heading towards the south headland, you pass through a lush eucalyptus grove offering shade and a delicious aroma. There are a few primitive camp sites (reservations required) at the south headland with outstanding views. 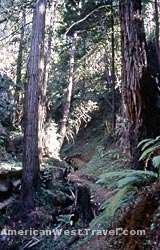 The park also encompasses a section of redwood forest set back from the ocean and the cliffs. A trail network penetrates the forest and offers a completely different experience in deep woods. If you have time, the trail reaches the top of the hills with more spectacular views of the coastline. However even a short half mile hike brings you to the pretty waterfall shown in the photo, far left. Julia Pfeiffer Burns State Park is on the Pacific Coast Highway (California Highway 1), just south of Big Sur.